2006. 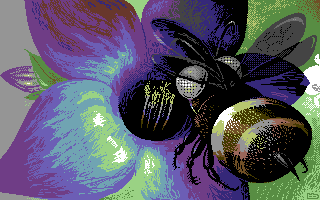 128 colours - 640x480 pixels - Amiga hi-res. Entry for the Breakpoint '06 graphics compo, placed 13:th. The idea was to ironize about the girl & dragon pictures, but it didn't work out very well... backgound and some other parts was rushed together and the picture is still unfinished. Unfinished? Yet it looks gorgeous. I really love those leafes.